Conventional wisdom holds that the decision to invest in an exchange-traded note depends on a straightforward calculus, the trade-off between credit risk and the ETN's tracking and tax benefits. Unlike an exchange-traded fund, an ETN is essentially an uncollateralized loan to an investment bank, with all the risks that entails. On the other hand, the banks promise exposure to an index's return, minus fees, regardless of how hard it is to own the index's underlying assets. On top of that, many (but not all) ETNs are taxed like stocks, regardless of the ETN's true exposure, thanks to a quirk in U.S. tax law. These benefits could be a godsend for a hard-to-implement, tax-unfriendly strategy owning, say, illiquid, high-yield micro-caps. Conventional wisdom suggests that as long as you keep an eye on credit risk, you can have your cake and eat it, too. It's wrong. ETNs are more dangerous than that. They are one of the easiest ways individual investors and advisors unwittingly enter into adversarial relationships with vastly more sophisticated investment banks. Unlike mutual funds and most exchange-traded funds, ETNs are not registered under the Investment Company Act of 1940, or the '40 Act, which obliges funds to have a board of directors with fiduciary responsibility and to standardize their disclosures. ETNs, on the other hand, are weakly standardized contracts, presumably between two sophisticated parties. Yet many investors conflate the two. Where an ETN investor should fear what he doesn't know, he instead is gulled into thinking he understands the risks and costs he bears. The first ETNs, iPath DJ-UBS Commodity Index (NYSEARCA:DJP) and iPath S&P GSCI Total Return Index (NYSEARCA:GSP), set a disturbing standard: path-dependent fees, which create tracking error to the index depending on the index's path. In contrast, mutual funds charge path-indifferent fees, which result in a constant percentage gap between an index fund and its benchmark. To see the difference, let's look at how fees contribute to tracking error of the Vanguard 500 Index (VFINX). 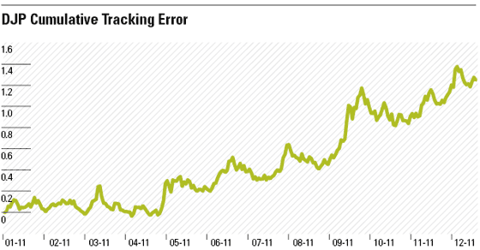 Below is a chart of the daily percentage difference between the fund and the S&P 500, its benchmark, in 2011. It's nearly a straight line, showing that each day the fund lagged the S&P 500 by roughly an equal amount. Starting from zero at the beginning of the year, it ended the year a little over 0.14%--a hair under VFINX's stated expense ratio of 0.17%. Like many Vanguard index funds, it lagged by less than its fees due to income-generating opportunities such as securities lending and futures arbitrage. Compare that with DJP's cumulative tracking-error chart over the same period. This chart is based on DJP's indicative value (the ETN analog of the net asset value). If DJP's annual "investor fee" of 0.75% behaved like an expense ratio, we'd see a smooth, upward-trending line terminating at 0.75%. Instead, DJP lagged its benchmark by 1.27%! Note how DJP's fees spiked most when the commodity index dropped the hardest, during the tumultuous fourth quarter. DJP's investors were slammed with extra losses at the worst time possible. The issuer, Barclays, earned the spread between its costs of hedging the index (almost certainly de minimis) and the ETN's 2.3% lag against the index during the financial crisis. This spread is extremely valuable because it's a source of positive returns during extreme down markets. To get a sense of how valuable this kind of insurance can be, consider how much investors pay to hedge bear markets. The cost of rolling VIX futures is one proxy for the insurance premium the market demands for bearing this risk. As of the end of February, the S&P 500 VIX Short-Term Futures Excess Return lagged the VIX by nearly 30% annualized over the past five years. If investors are going to bear additional downmarket risk in their ETNs, both theory and the market say they should be handsomely compensated. Why did DJP behave like this? It's all stated in the prospectus. In short, fees are subtracted every day from a "shadow NAV" based on before-fee performance since inception. The since-inception part is important because it means the fee is calculated from a weighted average of the index's value over time. The implications of this unusual fee calculation are not immediately obvious. The prospectus helpfully shows four hypothetical paths the ETN can take and how much it can lag the index. The fourth example, on page 11 of the ETN's pricing supplement, lays bare the perils of path-dependent fees. Over 30 years, the index returns negative 2.37% annualized; the ETN, negative 8.54% annualized. As the financial crisis showed, the kinds of sharp drops that generate big lags aren't impossible. Granted, the calculation can favor investors during sharp rebounds. In the most extreme scenario, the investment bank's fee approaches zero. However, such a benefit is poor consolation for the unpredictable tracking error (path-dependent fees throw the cherished perfect tracking of ETNs right out the window), the terrible timing of losses, and the asymmetrical payoff structure (tightly capped losses for issuers and huge potential losses for investors). Event Risk Hedge Cost: a 4.004% annual levy on top of the 1.35% investor fee charged by UBS's ETRACS short VIX ETNs ((AAVX), (BBVX), and so on). 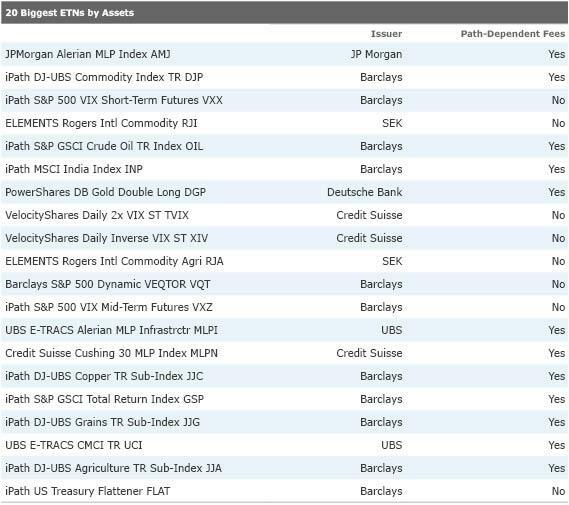 Futures Execution Cost: a 0.10% added fee levied by Barclays' iPath Pure Beta commodity ETNs ((NYSEARCA:BCM), and so on). Index Calculation Fee: a 0.50% charge subtracted out of the index for Credit Suisse's Liquid Beta ETNs ((NYSEARCA:CSLS), (NYSEARCA:CSMA), an so on). When many players in the industry behave in ways that signal they can't be trusted, it raises questions about all ETNs. What a shame. The best ETNs can be truly useful tools, fulfilling their promise of tax efficiency and perfect tracking. The ETN industry has gotten away with such investor-unfriendly behavior by free-riding the goodwill conventional ETFs have created as simple, low-cost, transparent, tax-efficient products. Understandably, many investors have taken for granted that the ETNs' headline fees are calculated just like expense ratios, that "gotcha" fees are not facts of life. It's a lot easier than combing through hundreds of pages of a prospectus. Given how publicly accessible ETNs are, buying one should not be an exercise in legal minesweeper. Until this situation changes, caveat emptor. 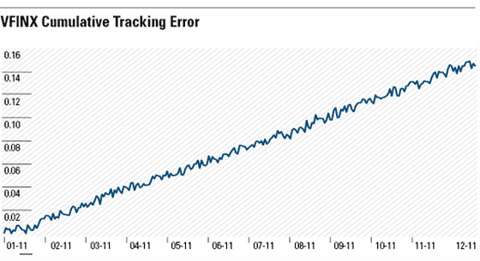 *As a convention, tracking error is often calculated as Index Return - Fund Return. This is a good estimate when the numbers involved are small, but misleading otherwise. The proper way is to find the geometric difference, calculated as (1 + Index Return)/(1 + Fund Return) - 1. Disclosure: Morningstar licenses its indexes to certain ETF and ETN providers, including BlackRock, Invesco, Merrill Lynch, Northern Trust, and Scottrade for use in exchange-traded funds and notes. These ETFs and ETNs are not sponsored, issued, or sold by Morningstar. Morningstar does not make any representation regarding the advisability of investing in ETFs or ETNs that are based on Morningstar indexes.